Dê um passeio sob as estrelas para descobrir os segredos escondidos e cantos sombrios de Florença. Nesta excursão a pé de 2 horas, ouça lendas do Renascimento e contos sobrenaturais enquanto passeia por praças românticas e vielas pouco iluminadas. Veja os marcos icônicos da cidade iluminados sob o manto da noite ao descobrir um lado de Florença que não é encontrado em nenhum guia. This was fantastic - definitely one of the highlights of our trip! Even as art and history enthusiasts, this tour really helped us understand the hidden history and heartbreak of incredible Florence. Our guide Enrico B. was absolutely top notch. Florence at night is less crowded. Do this tour! Lovely guide with lots of historical and cultural information about the city. We enjoyed walking throughout the city for 2 hours and finding new neighborhoods to explore and learning new facts about the vibe of Florence throughout the ages. This was a semi-private tour. The guide, Leonardo, custom designs the tour based on the group. 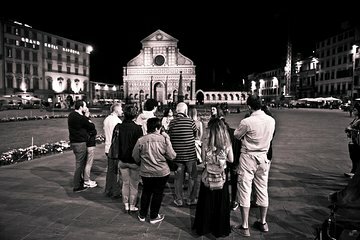 Our group was interested in the history of Florence. The guide did an excellent job of mixing history with unique quarks legends of the city why stones or wooden panels are on the walls. He was well versed in the city's history, art and full of energy. He also pointed out areas less visited by tourists. His expertise seems to be Michelangelo. We enjoyed the guide so much that we requested a private tour of the Dome. He did an excellent job!! Really nice tour. First time in Florence and it was much more crowded than I expected. Our group was just my family which was nice. Our guide tour overload has caused me to forget her name??? was born and raised in Florence. She was very enthusiastic about her home and showed us many very interesting places off the beaten path. Crossing the river into the non-tourist side of Florence was a treat. No crowds and many unique landmarks. 2 hour walking tour was at a leisurely pace. Not a bad way to spend an evening in Florence. Erica was great we loved the tour and the sights. I will say this - the next day we took a bike tour that overlapped some of the sights and to be honest we were told different things about the same sights by the next guide? Not sure which was correct but - two guides with different information? However Erica the guide for this tour seemed well prepared and wiling to acknowledge if we inquired about things she was unsure of. This tour was wonderful. Our guide was very knowledgable. I would highly recommend. Beautiful to see at night! Especially magical in the rain. This was a nice tour, learnt a fair few things we didn't already know and it was an easy pace. Nice guide. Recommended.